Last Sunday, I attended the film with my mother, mother-in-law, and sister-in-law. I was blown away. Loved it. Like any good meal, fine beverage, or other work of art, it wants savouring. It takes time to digest. And so, here I am, a week later, blogging about it. First, a word about music. In a previous life (only about 25 years ago), I was a music major. Total miscast, that one 🙂 But I learned a few things that have stood me in good stead as a writer. In my first year, I was introduced to the structure of symphonies. Like most other art forms, symphonies tell stories. They’re told in several movements and bound together thematically by the leitmotif. Think of Bethoven’s Fifth. The opening bars provide the listener with the motif. The motif appears throughout the work in its rhythm and interval, but it transforms through key and tonality. Another example is Berlioz’s Symphonie fantastique. The leitmotif appears first as a lilting flute line, reflecting the main character’s beloved. Through the movements, the motif transforms into a parodic witch’s dance on the main character’s grave and ultimately to the main character’s redemption. Classical music is a wonderful exercise in structure. Get into a music appreciation/analysis class sometime and you’ll see. All kinds of good to be taken away to the writer’s desk. 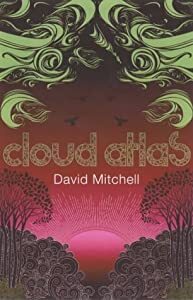 So back now to Cloud Atlas. Based on David Mitchell’s novel of the same name, the movie is a masterful symphonic composition. Six stories play out simultaneously, weaving back and forth between one another and bookended by a seventh. The movie begins with an old man telling a story around a camp fire under a starry sky. His face bears markings reminiscent of Maori, or other aboriginal cultures, and he speaks in a form of pidgin English. Though the movie moves back and forth between the stories constantly, I’ll lay them out in a more or less chronological fashion. In 1849, lawyer Adam Ewing travels to the Chatham Islands to conclude a business contract for his father in law, Haskell Moore, a man famous for his tracts on the moral rectitude of slavery. While on the islands, Ewing is horrified by the manner in which the slaves are treated. He meets Dr. Henry Goose as he digs for evidence of cannibals and subsequently contracts some form of parasite, which Goose promises to treat for him. One of the slaves stows away on Ewing’s ship and convinces Ewing first to hide him, then advocate for him. Goose is actually poisoning Ewing in an attempt to steal his gold, and the slave saves Ewing’s life. In 1936, gay composer Robert Frobisher leaves his lover in Cambridge and becomes amanuensis to famed composer Vyvyan Ayres in Edinburgh. His goal is to complete his own work and while under the thumb of Ayres, he becomes embroiled in the drama of Ayres’s “Jewess” wife (remember this is pre-WWII), and seeks solace in the travel journal of one Adam Ewing. He writes letters to his lover, Rufus Sixsmith. Ayres hears Frobisher’s composition, The Cloud Atlas Sextet, and attempts to take credit for it. Frobisher shoots Ayres and flees, completes his masterpiece living under the assumed identity of Adam Ewing, and ultimately commits suicide, leaving his work to Sixsmith. We leap to San Francisco (coincidentally the home of Adam Ewing) 1973, where journalist Luisa Rey bumps into a much older Sixsmith, who is now a nuclear physicist. Sixsmith wants to disclose something to Rey, but before he can, he is murdered. As she follows the clues, Luisa discovers Frobisher’s letters to Sixsmith and falls in love with their story. This leads her to a second hand record store where the proprietor plays The Cloud Atlas Sextet for her. She determines to solve the mystery of Sixsmith’s murder. At the reactor where Sixsmith worked, Rey meets Isaac Sachs, who gives her incriminating evidence against the plant’s owner who is purposefully looking to engineer a failure to feed Big Oil interests. Though Rey becomes a target of the assassin, a war buddy of her father’s helps her out and she survives to write her expose. In 2012, publisher Timothy Cavanaugh watches one of his authors throw a critic off a balcony in front of a room full of witnesses. The spendthrift wastes the ensuing windfall and when the author’s criminal family come to claim their share of the profits, Cavanaugh flees to his long suffering brother, who institutionalizes him in a nursing home reminiscent of One Flew Over the Cuckoo’s Nest. Eventually, in a series of comedic misadventures, Cavanaugh escapes and pens a screenplay of his story which becomes a major motion picture. He also writes of Alexander Solzhenitsyn in his screenplay. I believe Rey is one of his other authors. In dystopian Neo Seoul of 2144, Sonmi-451, a fabricant waitress, comes to the awareness that she is a member of a slave race. Freed by Hae-Joo Chang, a member of the resistance, she studies Solzhenitsyn and Cavanaugh’s movie as she is inducted into the underground. Fabricants, told that they are going to ascend, are in fact slaughtered and recycled into the food that feeds them. As the final battle between Neo Seoul military forces and the rebellion plays out before her and she watches Chang die, Sonmi-451 broadcasts her message of hope and freedom. When she later tells her tale prior to being executed, she influences the man who interviews her. He now believes as she does. Finally, the post-apocalyptic Hawaiian Islands (approximately 2321) form the setting of the final story. Zachry, a devotee of the goddess Sonmi, is plagued by visions of “Old Georgie,” his tribe’s version of the devil, after failing to save his brother-in-law Adam from the cannibalistic Kona. A Prescient (the remnants of technological society after “the fall”) named Meronym visits from the mainland. She is on a mission to save humanity by activating a distress beacon located on the island. The beacon will send a call to humans who have settled off-world. Radiation will kill everyone on Earth if they can’t evacuate. In the process Zachry and Meronym find the recording of Sonmi-451’s broadcast. We return to the even later, where the old storyteller, Zachry, finishes his epic tale. His audience is composed of his many grandchildren. At the end of the tale, Zachry shows one of the children where Earth winks in the sky, then ushers them inside where Meronym waits to embrace him. While it may seem that I’ve spelled everything out here, I haven’t. The story, or stories, are much more complex than that. When I first emerged from the movie, in a bit of a daze I must admit, my first thought on its theme was: The truth shall set you free. While I still think this holds true, there are many themes in Cloud Altlas, just as there are many stories that intertwine throughout the movie. Slavery appears overtly in Ewing’s story as well as in Sonmi-451’s, but prejudice and the abuse of power go hand in hand with it. Homophobia and anti-Semitism appear in Frobisher’s story and the abuse of the elderly in Cavanaugh’s story. Zachry’s tribe lives in ignorance and is victimized by the Kona. Cannibalism features in Ewing’s tale as well as Sonmi-451’s and Zachry’s. The abuse of power shows up in all the stories one way or another, from Haskell’s assertion that slavery benefits the enslaved, through Ayres’s attempted appropriation of Frobisher’s work, corporate espionage in Rey’s story, Cavanaugh’s commitment, and the “right” of the Neo Seoul hierarchy to create a slave race to serve society, to the Kona’s slaughter of Zachry’s people and the abuse of secrets withheld from them by the Prescients. Knowledge is power could also be a theme as well as the enduring power of the creative work. With regard to the leitmotif, the endurance and influence of the creative work is one. Each story connects in some way to the next through the creative medium. Ewing’s travel journal, Frobisher’s letters to Sixsmith and The Cloud Atlas Sextet, Rey’s expose and resulting career as a mystery novelist, Cavanaugh’s screenplay, and Sonmi’s broadcast. The actors form another set of leitmotif, as most appear in every story. The make-up and effects are stunning. If I was still in school, I’d be writing a thesis on this movie 🙂 It is that good. Best movie I’ve seen this year. It’s the true-true.